» Should women learn self defence? Should women learn self defence? Feng Shou – some ideas from a female perspective.. It was a friend’s birthday dinner and we were all sitting around a rectangular table, a mixture of male and female. Across the table was a lady, with whom I wasn’t acquainted, she seemed pleasant and quite gregarious. My friend, whose birthday it was, mentioned that I practised Kung Fu to this lady, so I explained a little about our style being suitable for women as it didn’t rely on brute strength etc... I then added that I thought it was a good idea for all women to have some self- defence skills. To my amazement, she declared, in a loud voice, that she thought I was talking “complete utter rubbish!”. After a pause I asked her what she would do should she have the misfortune to be in a situation when she needed to defend herself. She replied simply and loudly, “By using my mouth!! I would talk to them or shout for help or I would be able to stop them with my powers of persuasion.” Considering her statement carefully, but moreover not wanting to enter into a potentially heated discussion with such a formidable orator at my friend’s birthday celebrations, I simply agreed that talking would be the ideal solution if at all possible and then promptly changed the subject turning to speak to a friendly chap on my right. There are some people you simply can’t reason with. Of course, ultimately, she was right, fighting is the last resort and if we do have to fight it could be argued, we have indeed lost. However, until a person is placed in a threatening situation, none can truly say how they will react. Our sense of survival is strong in all of us. In that lady’s experience she had never encountered a situation where she needed to use anything more than her verbal skills. If we consider that 45% of women in the UK have experienced some sort of domestic violence, sexual assault or stalking, though this figure relies on reported incidences, one site suggests the figure may be closer to 70% worldwide, then she is, indeed, one lucky lady. It’s a bit tricky to have a conversation if someone has grabbed you suddenly from behind placing their hand over your mouth. It is my sincerest wish that her opinion, based on her personal experience, never has to change. Recently, and in stark contrast to the lady above, an old lady came along to my T’ai chi group for the first time. We were doing a bit of sticky hands, and, I was showing her a little of what we teach, when she told me and a student, that she wished she had learnt self-defence years ago. She explained that as a shop owner she had been attacked four times, and on one occasion had to open up the shop, the very next day after a robbery and assault, on her own. How profoundly different can one person’s experience be from another? I wondered, presumably she had come to T’ai Chi for the usual exercise and relaxation reasons, why then hadn’t she taken up self-defence classes after the first incident? Here lies the rub. Why do many women and girls still avoid self-defence classes or martial arts, even if they have been attacked or subject to violence? Why do many women and girls prefer to learn T’ai Chi than Feng Shou? Why are there so few women in martial arts, especially in the higher grades? Or, perhaps more probing, why do so few women continue to practice a self-defence art? The truth is I do not know. Perhaps the answers are complex, both individual and universal, but, here are a few of my ruminations on the matter. Fighting is largely seen as a man’s domain, though it is fair to say that this is changing. Women are breaking into the field of boxing for example, think of Nicola Adams, reigning champion in the Olympics in 2012 and 2016, and there have always been some women practicing martial arts though perhaps not known. When I first started Feng Shou well over 2 decades ago, the class was largely dominated by men, there were few role models around at that time. There is a lot of violence against women in the media but few fight back in any effective way, portrayed very much as the victim, though of course there are exceptions. Where a woman does fight back, think “Kill Bill” or “Salt”, the female has gone through the most extreme brutal violence, somehow survived and has some even more tragic past. Is it possible that this repeated exposure to the victimisation of women or the inevitable tragic ending of a woman who does fight back, becomes some kind of social straight-jacket? From a young age girls are socialised into behaving in a certain way and, in the main, discouraged from fighting and even some forms of physical activity, if it is seen as unfeminine. Therefore, generally speaking, learning to “fight”/ defend themselves can seem alien, unfeminine and sometimes unacceptable culturally. Perhaps people don’t always separate a violent act from one of self-defence. Sometimes what a person is capable of when confronted with a violent situation, when we need to protect ourselves, might be unacceptable to the person’s psyche. Do we not like to think of ourselves as nice people? Nice women. Many martial art clubs promote competitive fighting, well let’s leave that to the peacocks shall we? Why do I practice Feng Shou? Originally my motivation, even though I had encountered at least four violent and several frightening situations by the time I was 22 years old, was actually unclear. Thinking back, perhaps it was because I had defended myself from a gang attack, whilst in a phone box, to such an extent that they had ran away, therefore I didn’t feel the need. Perhaps my attackers thought I was too much trouble? Or perhaps they were just messing????? Or maybe there was a random police car passing by, I couldn’t see past all the faces? It was extremely frightening but I also remember feeling annoyed because my Mum, on the other end of the line, was panicking able to hear terrible banging and shouting. To this day I do not know why they left though I can still remember the look of menace change to that of disbelief, then fear, on that young man’s face. So on the one hand I was kind of pleased and relieved to have defended myself, I had had a lucky escape, whilst on the other, being in shock and absolutely horrified at what I was capable of when in fear of my life. In reality, I didn’t want to think about it, ever. 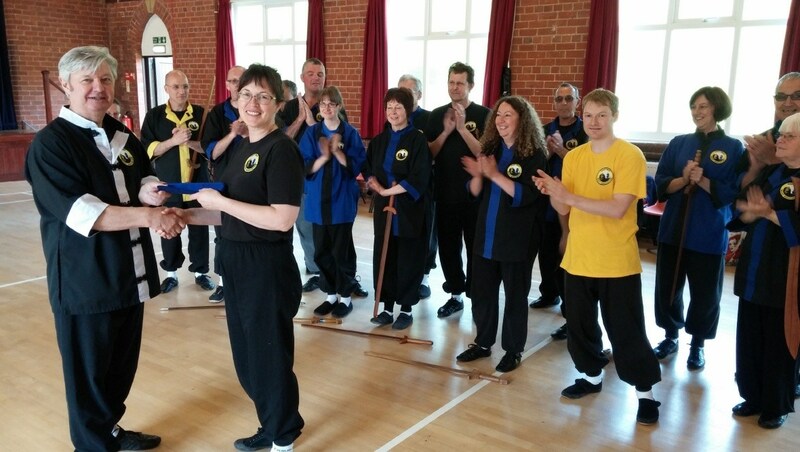 When I started training in T’ai Chi, back then if you wanted to train with Howard, then you had to attend his Feng Shou (Kung fu) class first before you could learn T’ai Chi – so really I had no choice but to learn it. Everything seemed so unnatural, very daunting, I didn’t ever want to have to fight again. Preferring to focus more on T’ai Chi as it seemed less scary, Feng Shou still had a draw. A hunter (attacker) will seek out the weakest and if a person believes themselves to be a victim (prey) then they are, that will be their fate. How true this is on many levels. So I set out to learn some skills, to become strong internally and to hopefully never have to fight again. If I did, however, the idea of having the ability and skills to defend myself in an effective, but, not necessarily harmful way also appealed. To be able to have some control over my reactions was something very important then and still is now. It’s necessary to put ourselves in situations we do not feel comfortable with in order to develop. Training in Feng Shou can feel very awkward at first because it might be a completely new skill for a female in particular. Learning to be comfortable enough to train in close proximity with another person requires a lot of trust. Practicing self-defence in a controlled and safe environment where we have the opportunity to develop our skills, is a valuable experience I continue to be truly grateful for. When we develop our sensitivity we will be able to sense trouble before it arrives and thus avoid it completely or diffuse it before it manifests. This is the ultimate goal I feel, and, in a way, relates on this level back to what the lady at birthday party was saying, by default. The arts followed the way of the female, there was a lot of talk about being soft and gentle but to be honest, although I liked the idea, didn’t really believe it nor did it seem that everyone followed the way to my untrained eye. Though it did seem to work somehow for other advanced students and instructors - it was all very confusing – just learning the sets and forms was challenge enough when starting from scratch. The idea that this style didn’t rely on bulking muscle and was suitable for females, children and older people suited me as I wasn’t particularly fit. In contrast to some other styles, how can softness possibly ward off a hefty strike? Well you have to practice and practice becoming softer and softer but with substance. I have found Feng Shou to be the structure within which we become softer and our touch lighter and yet your opponent feels you to be stronger. Once we embrace the physicality of training and importantly lose our fear, being soft within becomes natural, yin within. The practicality of training as a novice can be quite daunting. For example, learning to strike effectively can be difficult. It might feel so very alien, to be encouraged to strike at someone’s face and uncomfortable to have a hand aiming at your own during rollaways. Also, getting your partner to strike properly in return is a tricky balance to achieve. You see most people are nice and they find even feigning a strike difficult, quite often they target the air next to your face. Once you have both established a rhythm in rollaways, you have to ask your partner to aim for your face, slowly of course. I spent many years training with such nice people that when it came to a real strike, my ward-offs proved ineffective, having learned to ward off a miss. Once you find a partner who can strike properly in a controlled way, the techniques you are learning are more effective and really only work from a committed strike. That’s great isn’t it because the skills you learn are truly defensive and, as such, not born of aggression. There is a world of difference between this approach and some base applications of martial arts like cage fighting. 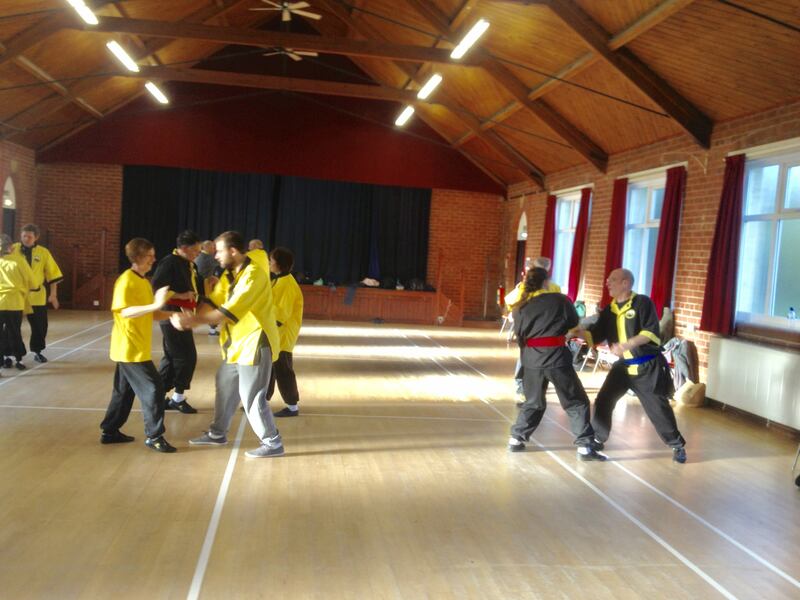 Feng Shou then could be said to be the loving practice of non-violent self- defence. Because we have to learn to control our reactions, careful not to cause harm, but training effectively so that your partner can develop too, it in essence, becomes a spiritual experience based on trust and cooperation. These days I have grown more confident in my practice and my reasons to train have changed from one of ambivalence (denial) and fear to that of pure joy and excitement. Practising Feng Shou is such an empowering and fun experience. To be awarded a Black jacket, something I didn’t dare dream about, and, because I had initially, virtually no understanding of, or ability in, the skills needed, did not even believe possible. I have been very lucky to have been able to train with Howard and all the other instructors and students over the years, their patience and guidance have been so important. 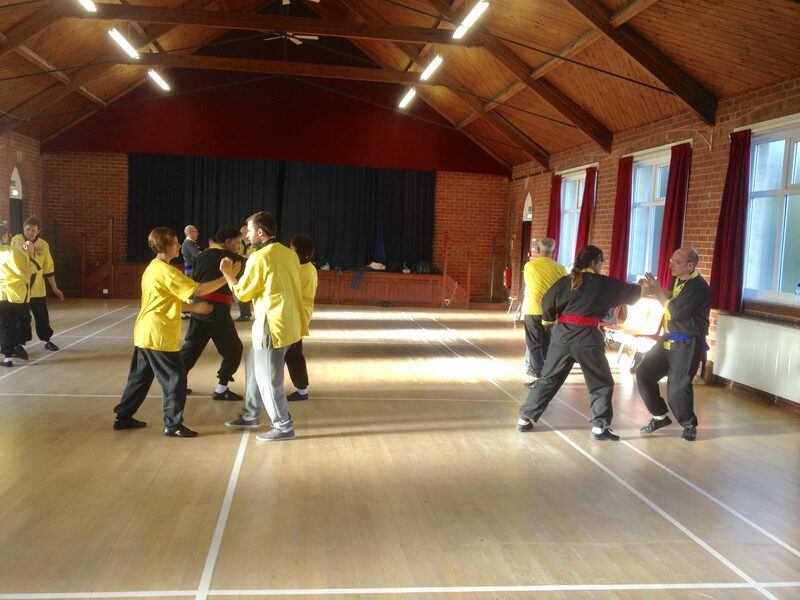 Even if you have little or no experience of self-defence training I would encourage anyone who is practising T’ai chi to learn Feng shou; they are totally intertwined and understanding both disciplines enhances your experience. Where T’ai chi helps relax and revive, Feng shou invigorates and delights. In an ideal world we can use our intellect and verbal skills to reason our way out of most situations and our sensitivity training helps us avoid difficult, possibly threatening situations, but Feng Shou will give you unparalleled understanding of yourself , if you dare open the door to who you really are.